For those of us who grew up with older gaming systems (shout out to everyone who remembers having to blow on Nintendo cartridges to get them to work! ), the introduction of games with characters that were originally released on those platforms are always met with big cheers and applause. One of my favorites to play with the neighbor boys when I was younger was Donkey Kong. As I was searching the shelves for a new game to try, I found Donkey Kong Country Returns seemingly waiting for me to check-out and get all nostalgic playing. Let me tell you, this game did not let me down. 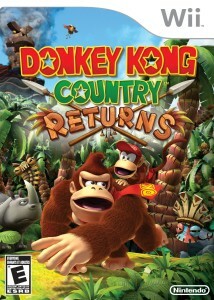 Donkey Kong Country Returns plays with just as much difficulty as the original Donkey Kong games, even complete with the side-scrolling features that are unmistakably Kong with the introduction of 3D movements and sequences to appeal to newer players. Familiar characters throughout the Donkey Kong franchise are present within this game with one neat introduction: two player cooperative play! Players can play two at a time: one as Donkey Kong and another as Diddy Kong. Brilliant! Hidden items, puzzle pieces, and other bonus surprises can be found throughout the levels with the option for you to eventually spell out K-O-N-G and win an awesome bonus! There are also additional levels that allow players the opportunity to slow down and strategize as they are greeted with new challenges, movements, and attacks.